Brad learned to fly and soloed at the age of sixteen. He landed his first airline job at the age of 23 and was promoted to Captain at the age of 25 and at the time was the youngest medium-body jet Captain in the country. Since then he has accumulated 17 000 hours in over 65 different aircraft types and has competed in Aerobatics at a national and international level. Brad Bennetts is currently a wide-body Senior First Officer and Instructor Pilot for South African Airways flying the Airbus 330/340 on the company’s international route network. 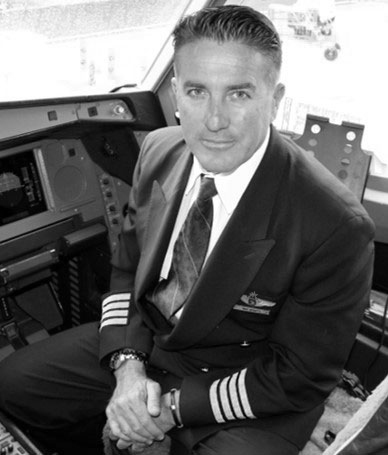 He has over 20 years of airline experience and has also flown the narrow-body Boeing 737 and Airbus 320 series. Brad is a certified airshow authorization examiner and a board member of Airshow South Africa. For 16 years, he owned and managed his own sponsored aerobatic team on the popular South African airshow circuit, flying over 500 surface level formation aerobatic demonstrations. He competed at the World Grand Prix of aerobatics competition in both Japan and the UAE placing second on both occasions in the team formation display category. Brad is one of the few pilots in South Africa to hold an Airbus Display Authorization and has displayed the Airbus 320, 330 and 340 at various airshow and sporting events around the country. Brad has also been involved in many aspects of CRM development and Organizational Behavior training for aircrew at South African Airways (SAA). Starting in 2012, by special request from SAA’s pilot management team due to his all-attitude experience, SAA engaged Brad to develop, lead and maintain the airline’s Upset Prevention and Recovery Training program. After completing the APS Phase 1 train-the-trainer program that same year, he spent 2 years developing SAA’s Phase 2 Boeing and Airbus UPRT program in consultation with APS. SAA has additionally successfully completed the APS Phase 3 and Phase 4 airline UPRT quality assurance audits. To date, Brad and his team of 12 dedicated UPRT instructors have trained over 800 airline pilots within the company in both initial and recurrent UPRT programs. Mr. Bennetts holds APS’ highest simulator qualification as an APS-certified Airbus Type-specific A320/330/340 Upset Prevention and Recovery Training (UPRT) Train-the-Trainer Instructor. He deploys globally to assist airlines with delivering APS’ UPRT directly to their airline pilots and/or assists airlines in developing their own internal ICAO-compliant, APS-certified Airbus UPRT program(s).